The growth of gaming apps and smart TVs coupled with the efforts of the electronics industry to promote next-generation processors has also led to the growth of the global market. Lastly, the heavy reliance of the masses on electronics in every sphere of work shal prove to be a lauch pad for market growth in the years to come. 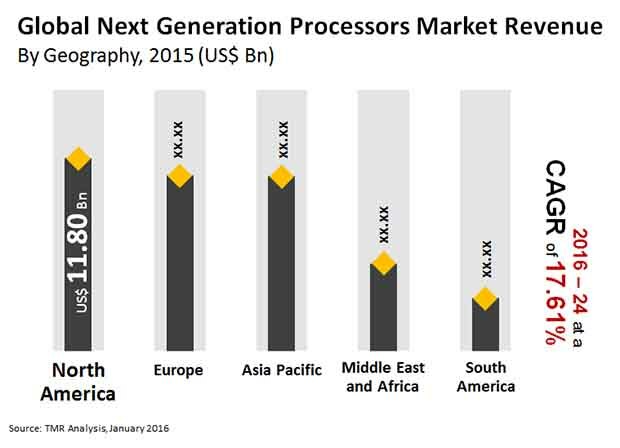 The crude material used for the manufacture of several types of next-generation processors incurs heavy expenses, and this is expected to hamper the growth of the global next generation processors market. Furthermore, the market players have not yet attained their optimal potential in the manufacturing and sale of next-generation processors. However, the extensive use of internet of things (IoT) technologies, electronic gadgets, and smart devices is expected to give an impetus to the growth of the global next-generation processors market. The review is based on TMR’s report titled “Next Generation Processors Market (End User - Consumer Electronics, Information and Communication Technology, Automotive, and Manufacturing; Machine - Handheld and Computers) - Global Industry Analysis, Size, Share, Growth, Trends and Forecast 2016 – 2024”.